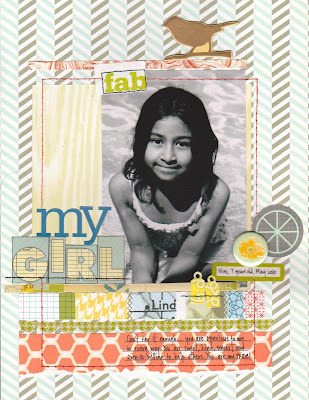 I love seeing Studio Calico's paper lines out there in other online galleries I frequent. How people mix and match the lines with other manufacturers always leaves me thinking, "Why didn't I think of that!?!" I thought I'd share some of those layouts with you today. Each artist is linked to their gallery so you can go and explore more! This layout by Tay created using the FabRips, the labels, Aperture, and the letters cut from Typo. I love the combination of the Cosmo Tiny Alphas with the Aperture paper, they perfectly compliment each other. crafty.kari's hodge podging of elements caught my eye, but I absolutely LOVE how she used the Month Stamps, filled in the April to date this layout. Cool idea. She also used the label stickers, hand cut the flowers from the Bouquet paper, and it appears that she used the Tiny Attacher. *Kristine* worked Anthology beautifully here. I love how she clustered around the photo using the label stickers, fabRips, and the flowers made from Compilation complete with leaves cut from the journaling cards. And putting everything on my favorite Lithograph paper makes the fun title using the blue alphas look like it's almost floating. I love how she did that! Mou Saha's layout starts on the herringbone side of Bouquet, and adds a bunch of other little bits from Compilation, Lithograph, Typo, Aperture, and Periodical. I love that she uses a tiny horizonal strip of the fabRips just under the photo. It's a nice bit of texture. She tops it off with a couple of well placed stickers from the label stickers sheet. 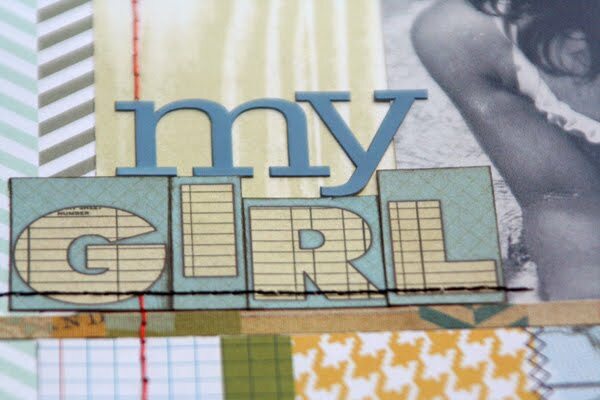 Julie S used the alpha side of Typo so well, it's classy against the soft feel of layout. I love that she used the journaling card just for the rose, it's so elegant, and fits perfectly here. And she was so brave to rip it up! The button rubons add another classy look. It's fun to explore this page! lainalamb worked with the label stickers and fabRips,, showing how little bits can be perfect! georgia keays layered Compilation, Lithograph, and Periodical then used bits of the fabRips to make a mannequin. How cool is that? I love that she based it all on the fabric sheet. It's a nice soft look. helpmeronda's title balances perfectly with some strips of the yellow side of Lithograph, which snuggle up nicely against the blue side of same paper. Don't you love how versatile double sided papers are? Make sure you keep loading your Anthology layouts to both our member gallery and other online galleries. And if you link products, it makes it even easier for us to find and feature here. Thanks to all those who's projects were featured today! Gorgeous work by everyone! Now I MUST have Anthology!!! Thanks for sharing Emily! OMG! Everyone is so very creative. I love them all and have some new tips to work on. These are so inspiring! Here's another of mine.